When PC manufacturers have a stab at making flatscreen TVs, their roots are often betrayed by two major factors - the resultant TVs cost less than most, but also look cheap. The AT3720 from Acer fits that bill, clocking in at an affordable £800 and it isn't exactly a vision in its depressingly coloured plastic husk. The AT3720's on-paper specification seems to be conflicting. The native resolution of 1366 x 768 is dandy, as is the 1200:1 claimed contrast ratio. But the claimed brightness of 450cd/m2 seems weak, even for a set as affordable as this. The connections go some way to redeeming things. Two HDMIs bask round the back of the set, which is not at all bad for the price. Those inputs are joined by two Scarts (both RGB-enabled), a component video input, a PC port, and an analogue tuner input. There isn't a CAM slot for adding subscription channels, because the AT3720 doesn't have a digital tuner. This is an almost criminal oversight for any flatscreen in 2007, so Acer duly gets its first slap on the wrist. This indignity is compounded by the primitive auto tuning capabilities that cause temples to throb. Apart from the aforementioned HD-ready status, features are extremely thin on the ground. We're wracking our brains to point anything out, apart from an unexpected bonus for gamers. The AT3720 is able to take 1080p feeds from an Xbox 360 through its component video jacks, but whether you'd want to bother is largely dependant on how this set performs. The signs haven't been that promising so far, so it will come as little surprise to discover that this LCD TV is an average performer at best. Getting the ball rolling with a hi-def Planet Earth feed from our Sky HD box (through an HDMI), the first criticism we're forced to make concerns black levels. Dark scenes, such as the decent into the underground insect-ridden cave, don't suffer from the extreme greyness that blights many a budget LCD TV, but there's a distinct lack of shadow detailing, rendering the whole visual experience unconvincing. Colours are adequate during bright scenes, but once the camera's in subdued environment, things go pear-shaped. The colour palette takes on a muted tone, which isn't good to see, and some hi-def material had skin tones that looked unnatural. 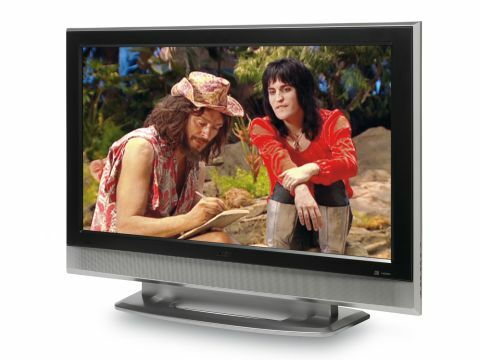 After underwhelming hi-def pictures, we steeled our nerves and played a standard DVD of the BBC comedy The Mighty Boosh. The results were less than amusing. Standard-def viewing is all over the place, suffering from smearing and break-ups during panning as well as the problems experienced with hi-def, only much worse. Looking at the AT3720s positives, we must confess that there is a reasonable amount of picture sharpness while watching a hi-def feed, for although the descent into Planet Earth's dark insect lair was beset with dodgy black levels, the writhing mass of insects are clearly and sharply rendered. Get some bright hi-def scenes cranked, and you'll see what this TV can do with colours. Sadly, this just isn't enough to earn the AT3720 any form of recommendation. Throw in some ineffectual audio and an irritating remote control to join the generally bad pictures and £800 is suddenly starting to look like an awful lot of money after all. Acer needs to go back to the drawing board after this effort.